Lyle: Listen to the lesson sample to hear the B.B. King style riffs you'll be learning. As well as learning a couple of solos, you'll also learn the chords, bass line and horn lines used in the jam track. Lyle: Let's start by learning the lead guitar riffs. This lesson is in the key of Bb. You need to be familiar with the Bb minor pentatonic scale because many blues riffs come from the minor pentatonic. The minor pentatonic is built from the root-b3-4-5-b7. 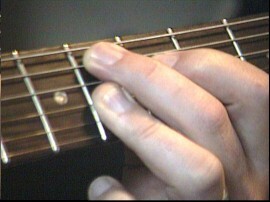 Lyle: The minor blues scale is another great scale for blues licks. It's built from the root-b3-4-b5-5-b7. The only difference is the added b5 degree. Lyle: Here's the jam track you'll use for this lesson. Try playing the two scales along with the jam track and you'll hear how the notes sound good with the music. Lyle: This is what I call a "box" pattern. 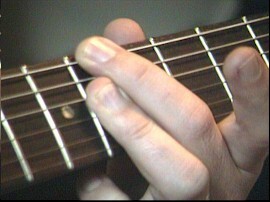 These are notes from the Bb minor pentatonic. A ton of blues licks will come from this little pattern of notes. Be sure to play and view this on the virtual fretboard to get a better look at the shape. Lyle: This next tab shows another important positioning of notes, just like the tab above that showed the "box" pattern. Lyle: A reminder: Last week I talked about the vibrato used in these simple yet powerful licks. Keep your vibrato quick and full sounding, just like Mr. King. Lyle: Here are a couple of short riffs using the patterns you just learned. 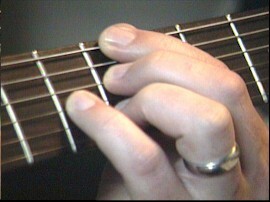 Lyle: Riff 2 has two types of bends, a whole step followed by a half step bend. 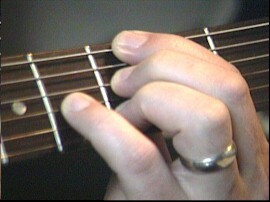 Lyle: Riff 3 has a thick and fast vibrato played by your index finger for the very last note. Lyle: Now that you've seen a few scale and riff patterns, I'd like you to try this next tab. This will show you some of these licks put right into a 12 bar jam. Lyle: I want you to notice that in the style of BB King, you play "around" the music. Listen to solo 1 and you'll hear the horns blowing a line (that's me playing the horns on my midi guitar), then the guitar plays a riff. 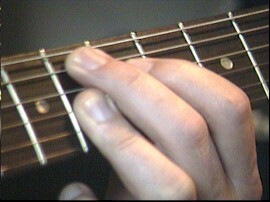 The little blues riffs are played "around" the horn lines. Sometimes when B.B. is singing, he'll play a quick riff right after he sings a line. Lyle: Here is another solo example with similar riffs. Again, notice the riffs are played around the horns as to not get in the way of them. Lyle: There you go, you're jamming like the King of the Blues now! Lyle: For extra study I'd like to show you the 5 chords, the bass line, and the horn lines used in the jam track. It's all good stuff to learn and practice. First, learn these 5 chords, then you'll learn how and where to play them. Lyle: The "walking" bass line is a fun challenge for you. Here you can get an idea of what the bass player has to deal with when playing the blues.